This medication is used for the temporary relief of symptoms from mouth sores due to injury. 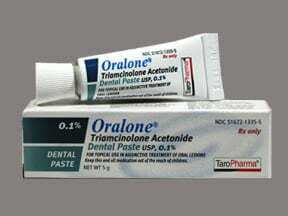 This drug comes in a dental paste that allows it to stick to the inside of the mouth/cheeks/gums. It works by reducing the swelling, itching, and pain that can occur with mouth sores. This medication is known as a medium-strength corticosteroid. What conditions does One Paste treat? Burning, itching, irritation, dryness, or redness of the treated area may occur. If any of these effects persist or worsen, notify your doctor, dentist, or pharmacist promptly. Remember that your doctor or dentist has prescribed this medication because he or she has judged that the benefit to you is greater than the risk of side effects. Many people using this medication do not have serious side effects. Tell your doctor right away if any of these unlikely but serious side effects occur: blistering, peeling. Rarely, it is possible this medication will be absorbed from the mouth into the bloodstream. This can lead to side effects of too much corticosteroid. These side effects are more likely in children, and in people who use this medication for a long time. Tell your doctor right away if any of the following side effects occur: unusual/extreme tiredness, weight loss, headache, swelling ankles/feet, increased thirst/urination, vision problems. List One Paste side effects by likelihood and severity. Before using triamcinolone, tell your doctor or pharmacist if you are allergic to it; or to other steroids (e.g., hydrocortisone); or if you have any other allergies. This product may contain inactive ingredients, which can cause allergic reactions or other problems. Talk to your pharmacist for more details. This medication should not be used if you have certain medical conditions. Before using this medicine, consult your doctor, dentist, or pharmacist if you have: herpes-type infection, other infections/sores of the mouth or throat. Before using this medication, tell your doctor, dentist, or pharmacist your medical history. It is not known if this form of triamcinolone passes into breast milk. Consult your doctor before breast-feeding. What should I know regarding pregnancy, nursing and administering One Paste to children or the elderly? Your healthcare professionals (e.g., doctor, dentist, or pharmacist) may already be aware of any possible drug interactions and may be monitoring you for it. Do not start, stop or change the dosage of any medicine before checking with them first. Before using this medication, tell your doctor, dentist, or pharmacist of all prescription and nonprescription/herbal products you may use, especially of: oral corticosteroids (e.g., prednisone). This medication has been prescribed for your current condition only. Do not use it later for another occurrence. A different medication may be necessary in those cases. If you are directed to use this medication for an extended time, laboratory and/or medical tests (e.g., adrenal gland function tests, morning cortisol blood test) may be performed periodically to monitor your progress or check for side effects. Consult your doctor for more details. Store at room temperature between 59-77 degrees F (15-25 degrees C) away from light and moisture. Keep this product tightly closed. Do not store in the bathroom. Keep all medicines away from children and pets. Are you taking One Paste? Are you considering switching to One Paste? How long have you been taking One Paste?